I have had great success making a colomba pasquale – Italian Easter dove cake – in a round pan, which is not the traditional shape but it tastes delicious. The colomba, or dove, is a symbol of peace, and there are cake molds available in a dove shape. Lacking just such a cake mold, I tried shaping the dove free-form, which looked like a pretty good imitation of a peaceful dove before I put it in the oven. But once it was baked, it ended up looking like a turtle hit by a car. It didn’t bake evenly either, so I’ve gone back to the round pan – it makes a perfect cake and I can be peaceful while it’s baking. While not difficult to make, the colomba needs plenty of rising time, so do this when you are planning to spend the good part of a day at home. Start by mixing warm milk, yeast and some flour with a teaspoon of sugar to make a sponge, and let it rise until doubled, about 30 minutes. Next mix eggs, lemon and orange zest, vanilla and melted butter, then beat in the sponge. Add more flour to make a soft dough, and turn out on board to knead until smooth. Add sultanas or raisins. 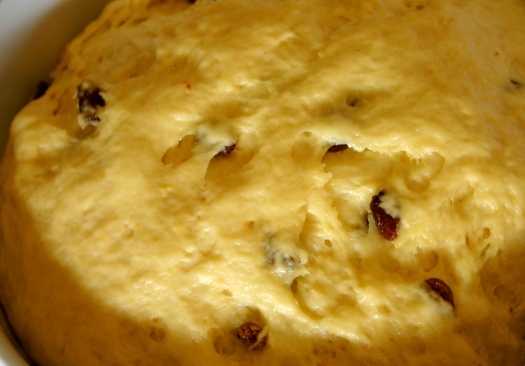 (Many colomba recipes call for candied fruit, which not everyone likes, so I eliminate it and add sultanas). 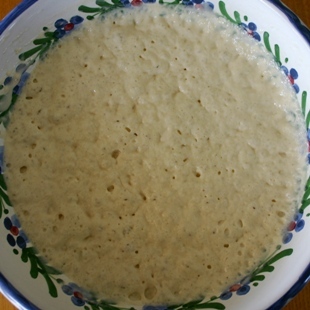 Place the dough in a buttered bowl and leave to rise until doubled, about 1 hour. Fold the risen dough over itself several times and place in desired cake pan – I used one large springform pan, or you can make 2 smaller cakes or 2 traditional colombe dove shapes. Cover and let rise until doubled, 60-90 minutes. Do not be impatient – complete rising will reward you with a beautiful light cake. In a food processor, grind whole almonds with sugar, then blend in egg white and cornstarch. Carefully spoon the almond glaze over the risen dough, being careful not to press on the dough and deflate it. 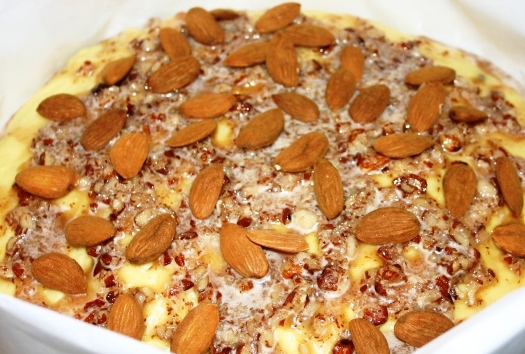 Scatter whole almonds over the surface of the cake, and sprinkle with confectioners sugar. Bake in preheated oven until cake tester is clean, covering top of cake with aluminum foil if almond glaze begins to get too dark. 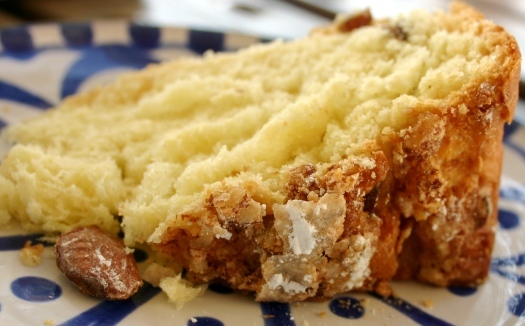 This is a soft, fragrant cake that does not keep for more than 3 days- but surely you will have eaten it all by then! And I see no reason why this cake has to be made only at Easter – it is wonderful with morning coffee or afternoon tea. 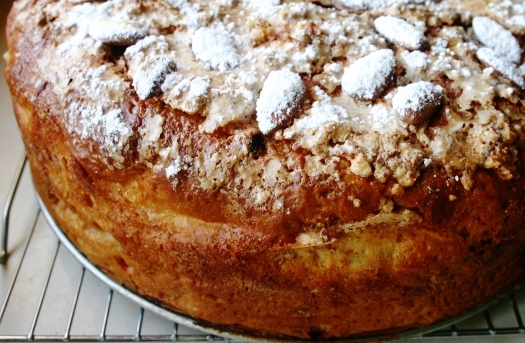 For the complete recipe, go to Italian Easter Cake. this looks fabulous and ‘doable’ and not just for Easter. I like the turtle image. Thanks. I am eating a piece as I read this, absolutely delicious! Definitely not just for easter. where do i get the dove pan? @Cathy – You can try a gourmet kichen supply store or do an online search – for instance, Golda’s Kitchen has paper molds that you can order. The cake tastes just as good baked in a round pan! I would like to try this cake. Where are the ingredient quantities please? I would like the recipe I have bake other times this cake and I lovel the taste also the I like to know the old colomba home made without sugar like with a boiled egg stuff inside well you know what I mean. Hope to hear froml you soon. I have found a slightly sweetened bread dough is often used with a boiled egg nestled in it- the dough is like a little nest for the egg.